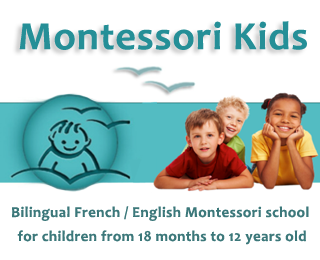 What is Montessori method ? The Montessori method is an educational approach developed by Italian physician and educator Maria Montessori base on self-directed activity, hands-on learning and collaborative play. Montessori education encourages children to explore their world, make creative choices in their learning, work in groups and individually in order to discover and explore knowledge of the world and to develop their maximum potential. Montessori classrooms are designed to meet the developmental needs of each child in every stage of life. Infant and Toddler Program (0-3 years) : at this stage, the Montessori educational approach helps them to develop confidence in their emerging abilities, to gain independence in daily tasks, gain respect for themselves, others and the world. Pre-schools and kindergarten (3-6 years) : the children develop self discipline in harmony with their own rhythm and pace. Practical activities, sensorial materials, language, art, craft and music ensure a very well-rounded development. The focus is on the development of ownership, joy in learning and self esteem in a supported and stress-free environment. Primary / Elementary school (6 – 12 years) : children continue to develop independence of thought and action, confidence, intellectual curiosity, concentration, self-discipline and enthusiasm for learning. In primary school, children are ready for more complex work as they move towards abstract ways of thinking. Many new materials (multi-sensory, hands-on, concrete and self-correcting) are introduced as they develop their imagination to embrace concepts beyond their immediate environment. Classroom materials and lessons include work in language, mathematics, history, the sciences, the arts, and much more. Middle school and high school (12-18 years) : Montessori education for this level is less well-developed than programs for younger children because Maria Montessori did not establish a detailed plan of education for adolescents during her lifetime. However, a number of schools have extended their programs for younger children to the middle school and high school levels.